Symptoms and pictures of dog toxic plants in alphabetical order. The treatment of choice is to induce vomiting. Before taking action, contact your veterinarian for specific instructions or a poison control center such as the ASPCA (888) 426-4435 ($60 charge per call). When calling let the Vet or hot line administrator know the type of plant (if you know it), the amount ingested, time and any signs of dog poisoning (difficulty breathing, salivation, vomiting and diarrhea, unconsciousness, shock, irritation around the mouth). Daffodil: Ingestion by dogs causes severe gastrointestinal illness, diarrhea, vomiting, convulsions, seizures, low blood pressure and tremors. Larger amounts can cause a cardiac arrhythmia. Daphne: An ornamental shrub with poisonous leave, berries and bark. Death Camas: This is a field herb with poisonous flowers, seeds, stem and and leaves. Delphinium (Larkspur): A wildflower where every part is toxic to dogs. Symptoms are vomiting and canine diarrhea. Dumbcane: This entire houseplant is dangerous for dogs to ingest. Diffenbachia: Symptoms of Diffenbachia poisoning gastrointestinal upset, breathing problems, difficulty swallowing, swelling around the mouth. Dologeton: Symptoms of Dologeton vary based on the amount consumer and dog sensitivity. Dumbcane: Symptoms such as irritation around the mouth, swallowing difficulty, respiratory difficulty, gastrointestinal problems. Dutchman' breeches: A garden flower with toxic foliage and roots. Easter Cactus: Ingestion causes vomiting, diarrhea and depression. Elderberry: Elderberry is a tree with dog poisonous leaves, bulbs, roots and bark. Elephants Ear: The entire house plant is toxic for dogs. Symptoms are stomach upset, breathing problems, trouble swallowing, mouth swelling. It can also cause vomiting, cramps, and possibly tremors and heart issues. 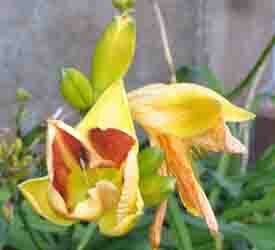 Emerald Duke: Same as elephant's ear in terms of dog toxic plants symptoms. English Holly: Symptoms of English Holly poisoning in dogs vomiting, abdomen pain and diarrhea. 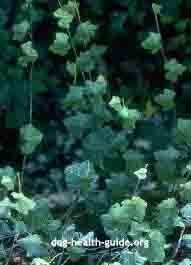 English Ivy: (branching, glacier, needlepoint, sweetheart California): These ivy varieties are all dog poisonous plants. They contain the toxin triterpenoid saponins. Symptoms include gastrointestinal problems (diarrhea, abdominal pain) and hypersalivation. English Yew: Symptoms in dogs are diarrhea, abdomen pain and vomiting. False Flax: A wild herb with dog poison seeds. False hellebore: An ornamental flower with poisonous roots, leaves and seeds. Fan Weed: Wildflower and herb with seeds that are toxic to dogs. Field peppergrass: A herb and wildflower with canine poisonous leaves. Foxglove: Garden and wild flower with poisonous leaves. Symptoms associated with Foxglove are diarrhea and vomiting. Glacier Ivy: Symptoms are similar to other dog toxic plants that are in the Ivy family such as vomtiing, diarrhea, abdomen pain, heart problems, respiratory problems and tremors. Ground Cherry: Symptoms of Ground Cherry dog toxic plants poisoning in dogs is diarrhea and vomiting. Heartleaf Philodendron: Causes swelling around the dog's mouth, stomach upset, respiratory problems, trouble swallowing, irritaiton and swelling around the mouth. Holly: A shrub with dog poisonous berries that cause intense vomiting, diarrhea, depression. Horse Chestnuts: This tree has nuts and sprouts that are toxic for dogs. Symptoms are diarrhea, abdomen pain and vomiting. Horse nettle: A wildflower and herb where the berries and all parts of the plant are toxic. Indian Turnip: Symptoms in dogs from eating this plant include diarrhea and vomiting. Indian Tobacco: Diarrhea and vomiting are symptoms in dogs associated with Indian Tobacco. Iris: This is a garden and wild flower that has toxic leaves and roots. Jack-in-the-pulpit: This plant irritates the mouth, causes swelling around the mouth, breathing problems and gastrointestinal upset. 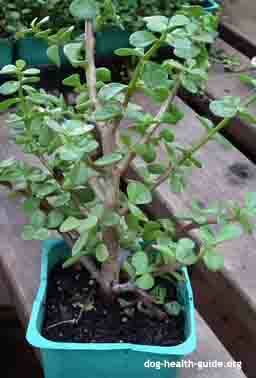 Jade: Causes slow heart rate, muscle coordination issues (ataxia), depression and vomiting in dogs. Jack in the pulpit: A wildflower where the entire plant is dangerous for dogs to ingest. Japanese plum: The Japanese plum causes symptoms in dogs such as diarrhea, abdomen pain and vomiting. Jerusalem Cherry: An ornamental plant where the foliage and unripe fruit is toxic for dogs. 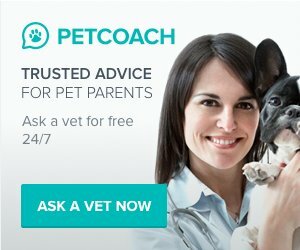 Symptoms in dogs includes vomiting, painful stomach, stomach cramps, tremors, respiratory issues, heart problems and kidney problems. Jimson Weed: A field plant where the seeds and entire plant are dog plant poisons. Kalanchoe: Like other dog poisonous plants, this plant causes gastrointestinal distress and well as heart problems such as problems with the rhythm and dog heart rate. Laburum: An ornamental plant with dog poisonous seeds, flowers and pods. Lantana: A house plant with dog plant toxic foliage. Larkspur: A wildflower that is toxic to dogs when the plant is young. Specific symptoms associated with these dog toxic plants include vomiting and diarrhea. Laurels: A shrub with dog poisonous leaves. 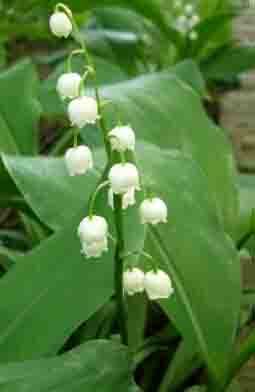 Lily of the Valley (Convallaria majalis): When a dog ingests Lily of the Valley leaves and flowers, it can cause diarrhea, vomiting, weakness, confusion, heart cardiac dysrhythmias. It can also cause death. Locoweed: This family of dog toxic plants is a hallucinogenic in dogs. Lupines: The pods and seeds of this shrub are dog toxic parts of this plant. Machineel Tree: The sap and fruit of this tree are toxic to dogs. Malanga: In dog malanga poisoning a dog will experience swelling or irritation around the mouth, trouble swallowing and breathing issues. Majesty: Symptoms in dogs include digestive problems, respiratory problems, trouble swallowing, mouth swelling. Marble Queen: Same symptoms as Majesty above. Marijuana: (hemp, hashish, hash): Dogs tend to avoid marijuana. It has a relatively low level of toxicity. Eating cannabis can effect the dogs central nervous system and result in a lack of coordination, diarrhea, drooling, fast heart beat, seizures and coma. Like humans, marijuana is a hallucinogenic. Matrimony vine: An ornamental vine that has toxic leaves and shoots. Mayapple: This is a wildflower that has unripe fruit, roots and foliage that are toxic to dogs. Mild vetch: This entire wildflower is poisonous to dogs. Mock Orange: Symptoms of this family of dog toxic plants in dogs are vomiting, abdomen pain and diarrhea. Monkey pod: Same as mock orange in terms of dog symptoms. Monkshood: Monkshood is a wildflower with poisonous roots and seeds in particular, but all parts are considered toxic. Moonseed: The fruit and roots of this vine are toxic to dogs. Morning Glory: The seeds and roots of this wildflower are poisonous to dogs. This is an hallucinogenic in dogs. Mother-in-Law: The Mother-in-Law causes symptoms in dogs such as trouble swallowing, respiratory problems, stomach upset and mouth swelling. Morning glory: The morning glory is a wildflower with poison seeds and roots. Mountain mahogany: This is a shrub with canine poisonous leaves. Mustards: Mustard is a wildflower with poisonous seeds. 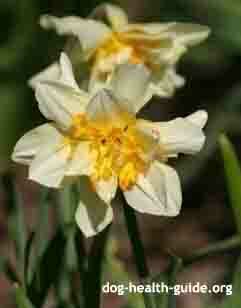 Narcissus: The narcissus has a bulb which is poisonous to dogs. Needlepoint Ivy: Symptoms of Ivy dog toxic plants vary but can include vomting, mouth swelling, difficulty swallowing, abdomen pain, cramps, tremors and heart problems. Nephthytis: Symptoms in this family of toxic dog plants includes mouth swelling, trouble when the dog swallows, breathing problems, and gastrointestinal upset. Nicotiana: Another garden flower with toxic leaves. Nightshade: A wildflower with toxic berries and leaves. Symptoms in dogs include vomiting, painful abdomen, cramps, tremors, heart issues, breathing difficulty and kidney problems. Nutmeg: Nutmeg is a hallucinogenic in dogs.